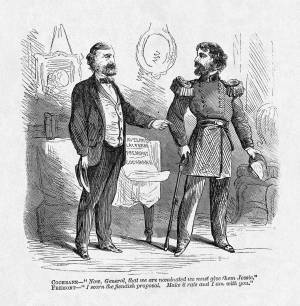 This discussion between the national ticket of the Radical Democracy-Congressman John Cochrane, the vice-presidential nominee, and General John Fremont, the presidential nominee-points to the popularity of the latter's wife, Jessie. When Cochrane advises using her to generate interest in their campaign, a shocked Fremont responds disdainfully that he would give the public rats instead. At the time, it was unusual for wives of candidates to play a visible role in their husbands' campaigns (see "Role of Women" in Campaigning) .